Individual intelligence is commonly associated with cognitive intelligence, though emotional intelligence is also getting a lot of attention nowadays (especially among leadership gurus). Going forward, a collective intelligence – the combined intelligence of systems and a network/team – becomes more important than individual intelligence. It makes more sense to compare collective intelligences, because teams and their intelligent systems are the actors of future competition. Cognitive Intelligence (IQ, GMAT, GRE, LSAT, etc.) – “the set of all mental abilities and processes related to knowledge: attention, memory and working memory, judgment and evaluation, reasoning and computation, problem solving and decision-making, comprehension and production of language, etc.”[i] People with a high cognitive intelligence often brandish the results of related tests on college and employment applications, some even put it on their LinkedIn profile; it is a status symbol in our society. Stereotype of someone with a high IQ: a brainy genius who you ask to solve a problem. Emotional Intelligence (EQ) – “the ability to monitor one’s own and other people’s emotions, to discriminate between different emotions and label them appropriately, and to use emotional information to guide thinking and behavior.”[ii] In Emotional Intelligence 2.0, Travis Bradberry and Jean Greaves break emotional intelligence into four areas – self-awareness, self-management, social awareness, and relationship management – and provide strategies to improve your EQ. A distinction they make frequently is you can improve your EQ, but cannot improve your IQ. Many of the leadership and personal branding experts assert that a high EQ is more valuable than a high IQ in most professions. Stereotype of someone with a high EQ: a social magnet who you ask to coordinate gatherings. Creative Intelligence (CQ, curiosity quotient) – capable of ‘generating original ideas’, open to new experiences, and inquisitive. People with a high CQ ‘stir the pot’ by challenging the status quo. Their ideas are not necessarily rooted in complex thinking (requiring a high IQ), but rather tweaking or thinking out of the box. In a HBR article Curiosity Is as Important as Intelligence, the author concludes: “CQ is the ultimate tool to produce simple solutions for complex problems”. Stereotype of someone with a high CQ: an edgy designer who you ask to create concepts. Contextual Intelligence – “the ability to understand boundaries of knowledge and adapt to other environments.”[iii] Understanding the nuances of different cultures and their social norms is critical as we become increasingly interconnected. Understanding variations in seemingly similar applications is important as the competition between new technologies stiffens. Stereotype of someone with a high contextual intelligence: a street-smart diplomat who you ask to understand a culture. Artificial Intelligence (Turing Test) – the intelligence of machines or software. Artificial intelligence is becoming a reality, some current applications include: feeding content in social media, asking IBM Watson questions through Verse (an email collaboration platform), and nudging by personal assistants on cell phones (Siri, Cortana, Google Now, etc.). It is a commonly accepted notion that AI becomes pervasive in our everyday lives. Though many outspoken leaders, Bill Gates, Stephen Hawking, and Elon Musk, have recently voiced concerns about the dangers of future intelligent systems. 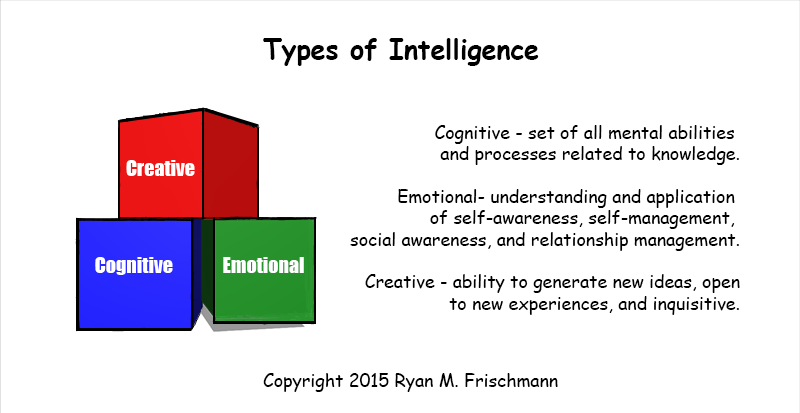 There are various forms of intelligence: cognitive, emotional, creative, and contextual. Fortunately, it is not just about how smart you are – personality, ingenuity, and street smarts are as valuable. Artificial intelligence (AI) is a reality. Leaders should optimize the collective intelligence of their teams. Leadership coaches tell leaders to improve their emotional intelligence (“EQ”). In fact, many say it is the single most important thing a leader can do to increase his or her effectiveness. Building relationships is the core of EQ, and since relationships are a two-way street, everyone contributes. A leader has to get to know his or her employees better. Hopefully, this leads to an opportunity for you (as an employee) to share things about yourself: insights, personal stories, values, and a sense of humor. The best advice is to be ready because an interaction might occur at any time: in an elevator, the lunchroom, or a conference room. Avoid clamming up because you do not want to say something wrong, yet acknowledge the fear so you show due respect. Try being spontaneous, though be careful what you say because it can be sticky. And just as important, it is an opportunity for you to learn about the leader; it is not all about you. If you get a chance, ask an open-ended question that prompts him or her to share a personal experience. A leader’s story might teach a lesson, establish trust, and/or simply make you laugh. On a professional level, you want to learn a leader’s methods (practiced ways of applying skills) and get candid feedback. Volunteer to ‘reverse mentor’. Teach new technologies or social media applications where you may have more experience and a different perspective; become a valuable resource, beyond simply performing your duties. When I was an early career professional, I used to coach my company’s sports teams. I remember a very well-liked leader played goalie for one of our soccer games. He was not much of a soccer player, but showed up on a rainy Saturday morning for us – no other reason. By the end of the game, he was covered in mud from making (or trying to make) saves. It was a thrill having him play with us. His simple participation cemented a bond with everyone on the team that day. Everyone remembers the game and, moreover, had an easy ‘ice-breaker’ to strike a conversation with him in the hall or lunchroom. From a leader’s perspective, you make great strides in building relationships by doing things purely for the sake of the team. From an employee’s perspective, participating in events outside the confines of the office – such as company sport’s teams, happy hours, etc. 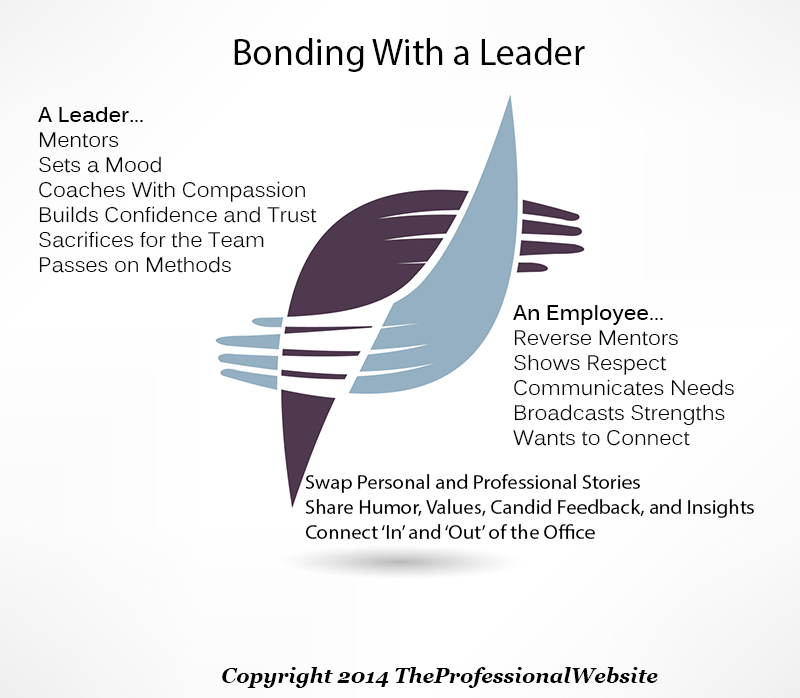 – are excellent opportunities to get to know coworkers and leaders on a personal level. The mood of a leader is contagious. It involves both emotional and social contagion. There are emotional triggers in our brain that fire immediately during an interaction; there is nothing we can do to prevent a physical reaction, like a rush of euphoria or discomforting ‘pit’ in our stomach. However, it is important to understand when we are flooded with emotions so we can react to them and improve our ability to learn. We might ask ourselves. Was my excitement from this presentation justified? Did I resonate with the leader? Did I resonate with the idea? Emotions can shut off clarity in our thoughts. I remember an exercise in a leadership course (business school) where we broke up into teams and gave presentations with the objective of influencing an audience (the rest of the class). The winner was not a team with the most elegant solution, but rather the one generating the most buzz –a mediocre solution presented beautifully; a scenario that plays out every semester in this class exercise. Emotions influence our short-term decision-making. Everyone benefits in improving their emotional intelligence. It affects all areas of our life, including: communications, career development, relationships, and happiness. 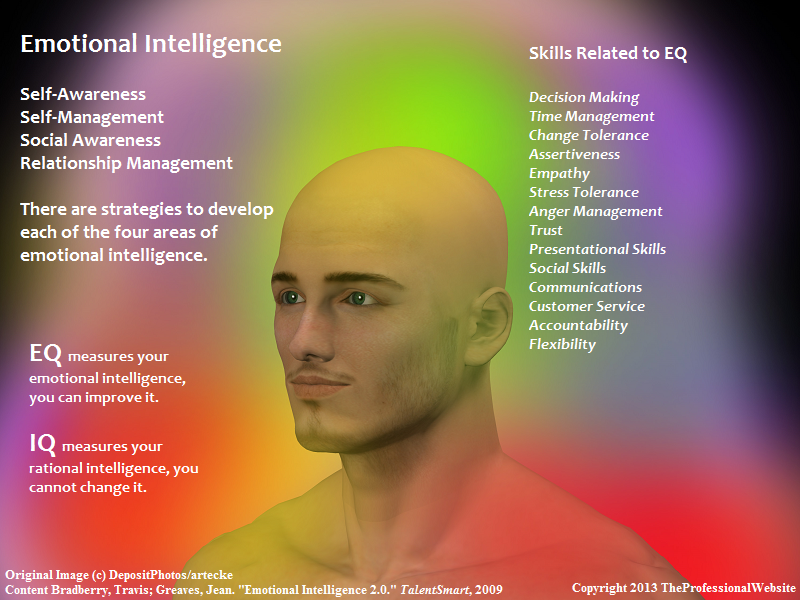 In a way, EQ measures wisdom and IQ measures intelligence. A higher EQ is a sign of maturity and can be improved upon while you are pretty much stuck with your IQ. According to Dan Schawbel, professionals should adopt a steady regiment of self-promotion. I read his second book, Promote Yourself: The New Rules for Career Success, where he basically picks up from where he left of from his previous book Me 2.0. In the book, there is great advice to gain influence and success for all professionals. Some of the themes of the book include: discussion of soft, hard, and online skills; cross generational communication; intrapreneurship and entrepreneurship; and the proper use of self-promotion. He categorizes skills into soft, hard, and online skills and provides compelling reasons why a professional must develop each type of skill. His arguments make sense in the context of personal branding. Mr. Schawbel says soft skills often have more influence than hard skills regarding success – something backed up by other sources I have come across. A trending adage is EQ (“emotional intelligence”) is more valuable than IQ (“rational intelligence”). However, I think hard skills have more of an impact on success than Mr. Schawbel gives credit. I know many brilliant computer programmers or economists who lack social skills, but are still very well-respected and accomplished in their fields. When I hire a computer programmer, in most cases I choose one who is going to program the best solution. There are many CEOs of startups whose skill sets heavily favor hard skills. There are three trends influencing the demand for hard skills: a skills gap, globalization, and automation (according to Mr. Schawbel). I think hard skills are extremely important and there is a lot of public discourse regarding how to best introduce and build these skills; in fact, there is a global movement to address shortages of professionals in STEM related fields (science, technology, engineering, and mathematics). Therefore, professionals who spend more time developing hard skills in these fields increase their chances of success – soft skills are less of a requirement. Every professional should have some basic online skills (related to leveraging social media to build an online reputation), but not necessarily to the extent Mr. Schawbel talks about in his chapter on online skills. I think your level of experience with online skills depends heavily on your profession. If your profession demands online interaction, you have insightful things to say, or you are a spokesman for your company, then fine-tune your online skills so you build an online reputaton (in social media and blogging). Otherwise, managing a personal website and LinkedIn connections should suffice. With a skills-based approach, I make a delineation of skills as transferable (soft and hard skills) or technical (hard skills). This is easier for career planning and development and for a target audience to search for and assess your functional value. Though, altogether, a skill set is comprised of the same skills. I think Mr. Schawbel’s analysis of collaborating between generations is well-conceived and useful. To illustrate cross generational communication preferences, here is a basic example: my father talks on the phone; I send email; and my nephew utilizes social media. There is a great table in the book where he outlines expectations of different generations. Social media is transforming how people connect and build relationships, and there are stark differences in how generations prefer to communicate. Overall, I think this book is a great read for all professionals, however as far as following the advice, it depends on your profession; some advice might be relevant, some might not be. The carrot for learning about emotional intelligence is it is something you can improve upon (unlike your IQ) and has a tangible reward – “every point increase in EQ adds $1,300 to an annual salary”. In the book Emotional Intelligence 2.0, Travis Bradberry and Jean Greaves define emotional intelligence and provide strategies to improve your score – something they argue will improve work performance not matter what your profession. They breakdown emotional intelligence into four areas: self-awareness, self-management, social awareness, and relationship management. Self-awareness is the cornerstone of emotional intelligence; all of the other areas depend on it. Being self-aware means you understand your emotions at any given time, and your tendencies in situations. You manage your emotions and do not let them manage you and remain calm during stressful situations. Soft skills which require self-awareness include leadership, empathy, and communications. Self-management is how you act or behave in a given situation and the strength is in being able to delay needs, show flexibility, and continually manage your tendencies. You can be patient and communicate with a group of people. Soft skills that require self-management include presentational speaking, social skills, flexibility, and customer service. Social awareness is tuning into others’ emotions and truly understanding the ambiance around you. Soft skills related to social awareness include team building, relationship building, and customer service. Relationship management is “your ability to use your awareness of your own emotions and those of others to manage interactions successfully.” To demonstrate strength in this area, you make strong bonds with others and are capable of building relationships in stressful situations. I read the book and look forward to practice the various strategies to improve my emotional intelligence. The strategies are straightforward. And I am convinced that if I learn to practice them in my everyday experiences, I will improve my soft skills that relate with working with others! I recommend reading the book: “Emotional Intelligence 2.0”, TalentSmart, 2009.